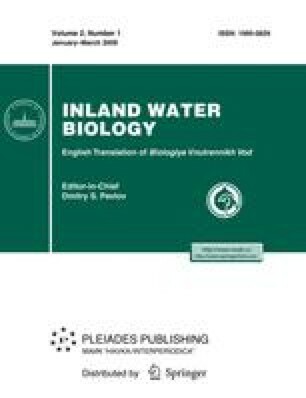 The species composition of freshwater heliozoan in the Central Russian Upland forest steppe has been researched using the Usman’ River and different waterbodies of Usmanskiy Les in Voronezh oblast as an example. Nine species and two forms of heliozoans from four taxonomic groups have been found, five of the species being new for freshwater heliozoan fauna of Russia. Illustrated descriptions are given for the species found. The highest species diversity of the studied protists was recorded for bogs, which indicates that they have more favorable conditions for these organisms than lakes and small rivers. Original Russian Text © M.M. Leonov, 2009, published in Biologiya Vnutrennikh Vod, No. 1, 2009, pp. 8–14.